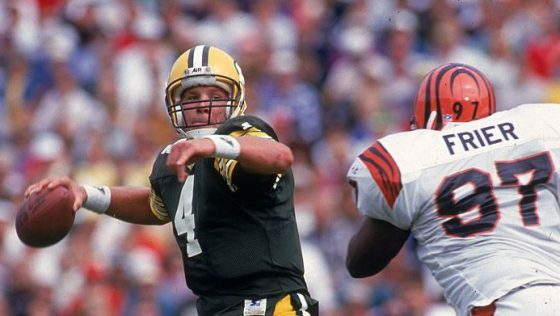 Brett Favre passes during his first victory as an NFL quarterback. When I look back on my 20 years … I can honestly tell you that I hold no regrets. Did we win every game? No. Did I make every throw? No. Did I make mistakes? More than I care to count. But I can tell you this. . … There was never one time where I did not give it all I could. This storied career took off on September 20, 1992 in a game at Lambeau Field in Green Bay, Wisconsin. Starter Don Majkowski was injured in the first quarter, so Favre stepped in. At first it was a memorable game for all the wrong reasons. Midway through the fourth quarter, the Packers trailed 20-10 as Favre was having a rough day with four fumbles and five sacks. With the game on the line, he threw the game-winning touchdown pass with 13 seconds remaining. They won 24-23. Favre had his first two NFL touchdown passes in that game while securing his first victory as a future Hall of Fame quarterback. It was certainly a defining moment for the young 22 year old. Meanwhile on the same day, 929 miles away on 119 South Main Street in Bridgewater, Virginia, a moment transpired that didn’t draw headlines though there was much rejoicing in the presence of the angels of God. 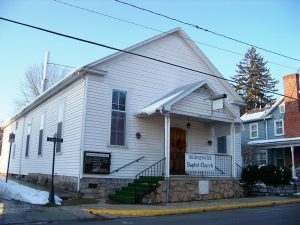 That morning at Bridgewater Baptist Church, two young men wrote back and forth on the church bulletin during the sermon. They met five weeks earlier as teammates on the gridiron at Bridgewater College. Mike Floyd explained how one becomes a believer, a true follower of Christ. The young man summoned the courage to walk up to the front during the final hymn to tell the pastor, “I want to accept Jesus Christ as my personal Lord and Savior.” As the hymn came to an end, the tears were just beginning to flow. It was a defining moment that forever changed a life. A rebellious heart was transformed through the gift of forgiveness through Jesus Christ. Who was the 17 year old young man? Me. This was the moment when I was “born again [into] a living hope through the resurrection of Jesus Christ from the dead” (1 Peter 1:3)—a defining moment when all things became new. Though for different reasons, both Brett Favre and I will always remember September 20, 1992 with deep gratitude and fondness. For Favre, it defined his career. For me, the moment defined my life in this age and the age to come. It was a defining moment that changed everything. Wow! I loved this post. Thank you for sharing your journey with us, Brian! Thank you Christine! Much love to you, Jason, and the little one!